Posted on Sat, Jan 7, 2012 : 9:30 p.m.
Dentition problems can be behind a cat's changing eating habits. In most households, the humans will tell you that there is one sure-fire way to get a pet's attention: open the refrigerator door. Living with humans has likely changed the way that pets think about food as a whole. It can be a bit ho-hum at times for them and terribly disconcerting when you see them turn up their nose at the bowl of food that's plunked down in front of them. Cats are usually the species associated with being fussy or finicky. However, while their eating habits can be fussy, it's a little daunting for those who share life with them when, suddenly, they don't seem interested in eating at all. Most of the time, it's no cause for alarm, and there are ways to help overcome the food boredom that some felines experience. Having said that, it's important to fine tune your skills as the cat's caregiver to discern if it might be a serious problem and if a call to your veterinarian is necessary. As a wise clinician told me years ago: "Remember, you know your pet better than anyone. You are my first line of defense in helping your animal." There are a few tricks and things to keep in mind to help your furry friend get over a gastronomical slump, and they are easy to employ. Think about it — we all prefer food that smells fresh and appetizing. Most cats free feed easily, but if their bowls are too full and the kibble sits for too long, some cats get fussy. Try adding food throughout the day to keep them interested. Most folks feed at least a little canned food to show their cats a little love, and keeping portions small at each feeding is a boon for both human and feline. This achieves two things: you avoid from wasting any uneaten food and the grub remains fresh for the duration. Capitalize on kitty's sense of smell. Our sense of smell is integral to allowing us optimal enjoyment of what we eat, and the same holds true for pets. Improving the palatability of your cat's wet food is easy: try sticking it in the microwave for a few seconds. Heating the food slightly will release the aroma and likely will encourage Fluffy to chow down. Yes, cats even have a preference as to what kind of canned food that they like. Most cats prefer paté style, as opposed to flaked or even chunks. If you're offering one of the latter two, stick to a pate instead. Some cats are just plain bored. In the wild, cats have to hunt for food and most certainly have retained a lot more of their hunting skills than dogs have. Consider using a foraging toy to encourage them to work for their food. Most cats love it and will gain enjoyment out of working with toy like the Bat-A-Rat, which is made in Michigan. Click here to read more on foraging toys for cats. If none of these tactics work, consider what Dr. Marty Becker, DVM suggests on his vetSTREET blog. Trying some of your pet's most valued treat food, like some cooked chicken or fish, can be helpful in jump-starting its appetite. In any case, if your cat is still turning down food regularly despite your best efforts — and especially if it is losing weight — a visit to their veterinarian is needed to get to the bottom of the problem. Lorrie Shaw is lead pets blogger for AnnArbor.com. Connect with her on Google+ and follow her daily pet adventures or email her directly. Mon, Jan 9, 2012 : 6:08 p.m. I have a few cats so I've seen many issues regarding feeding and have used many of the tips given above. They do get finicky so a change is sometimes needed but they often return to the other flavors once you've introduced something new. Cats need more wet food than dry because they need more moisture in their bodies. Moisture helps fight illness, keeps the body balanced, and helps fight issues such as bladder issues. Dry food should be a small part of the intake of food. Owners sometimes don't track what cats eat and they should. Major and minor illnesses, swallowed objects, and hairballs can prevent a cat from eating much or at all. Cats should eat something every day and if they go more than two days without eating, need to see the vet immediately. They might eat well one meal and not the rest of the day when sick but should begin eating more the next day. If not, the cat needs to see the vet. The owner might see a decline in intake of food over a couple of days before the cat stops eating all together. That's also when the cat needs to see the vet. Sometimes cats have hairballs which, until they come up or pass, makes the cat not want to eat. A cat who frequently gets hairballs should be given Laxatone to help pass them. 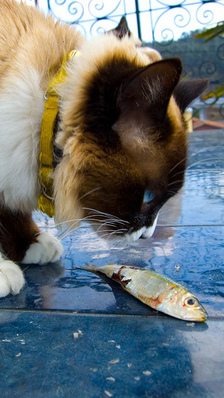 If a cat's swallowed an object, they may not eat much or at all until the object has passed or been tossed up. When a cat isn't feeling well-and they have their days as we have ours-they will skip a meal or two. I give my cats tuna juice and water mixed and fed by hand with a syringe (sans needle) when they've skipped a meal and don't want to eat the next meal. Feeding them by hand gives them some calories to keep them going. But if they continue not to eat, I take them to the vet. Sick cats are often enticed to eat by adding tuna or tuna juice to food. Boiled chicken-no salt, no herbs-and or boiled liver are good enticements as well. Wed, Jan 11, 2012 : 5:27 a.m. The tuna packets flavors with lemon are another good thing to keep around too, to coax a feline's appetite I've heard from clinicians. Thanks for sharing your experience, JMA2Y! Sun, Jan 8, 2012 : 2:20 p.m.
hyperthyroidism is a very common malady in older cats and can be associated with both poor eating or excessive eating...but weight loss in both cases. once diagnosed its curable by an expensive radioiodine treatment ( available at only one place in the area) ...or managed by either special diet or an intradermal ear ointment. Wed, Jan 11, 2012 : 5:25 a.m. Thanks for pointing that out, bedrog. People need to be on the look out for medical issues when dietary changes occur. I appreciate you comments! Sun, Jan 8, 2012 : 8:36 p.m.